Liverpool Player Ratings v Southampton- How did the media rate them? Liverpool really did not have to get out of second gear as they managed an easy 3-0 win over Mark Hughes’ Southampton over the weekend- the scoreline a repeat of their win from last season. The Reds tried out a 4-2-3-1 formation at the beginning of the game to accommodate Xherdan Shaqiri, but reverted back to the 4-3-3 that Klopp has generally favoured after the Swiss international’s withdrawal at half time. The win also means that LFC are the only team in the league with a 100% record following Chelsea’s goalless stalemate at the London Stadium against Manuel Pellegrini’s West Ham. That Liverpool didn’t really hit their stride, but were also not posed any real problems, is shown in their ratings, with most players earning a 7 for their efforts at Anfield. Southampton took 90 minutes to register their first shot on target, and that was easily saved by Alisson. Most of the papers, bar the Echo, thought that Virgil van Dijk was the best LFC backline player on show. They also agreed that Xherdan Shaqiri had an impressive full debut. This entry was posted in News and tagged Joel Matip, Southampton, Virgil van Dijk, Xherdan Shaqiri on September 25, 2018 by lzozo. Liverpool made it six wins in as many games as they brushed aside the challenge of Mark Hughes’ Southampton at Anfield on Saturday afternoon. For Saints, it was effectively a repeat of last season’s game, having lost 3-0 in 2017/18 as well. LFC had the game wrapped up by half time, and didn’t even have to get out of second gear- this was a pretty easy win for them despite Southampton’s best efforts. Reds boss Jurgen Klopp handed Joel Matip and Xherdan Shaqiri their first league starts of the season and opted for a change in formation to 4-2-3-1. 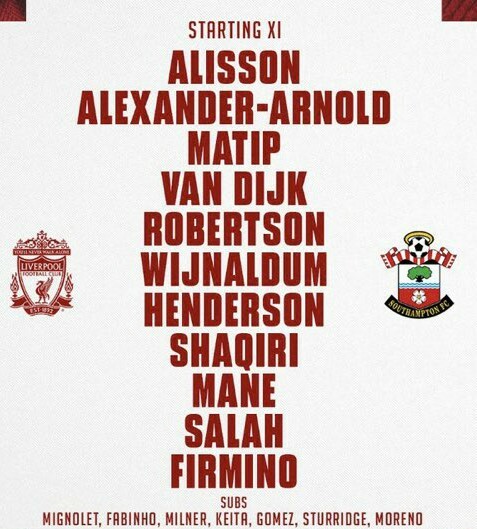 This saw Henderson and Wijnaldum in midfield, Salah as the sole striker upfront, Shaqiri effectively employed as a No.10, with Roberto Firmino on the left and Sadio Mane on the right. This entry was posted in News and tagged Joel Matip, Mohamed Salah, Southampton, Trent Alexander-Arnold on September 23, 2018 by lzozo.